The performance of the model CTR6500 resistance thermometry bridge is improved significantly by using the proven AC bridge technology. 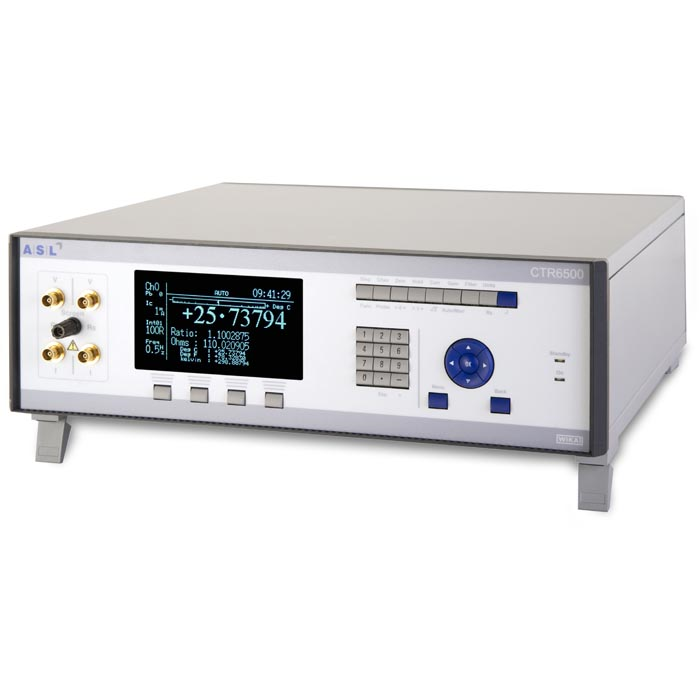 Due to the elimination of thermal EMF errors and the automatic cancellation of probe and cable reactance effects, the CTR6500 provides exceptional stability with time and ambient temperature and has an excellent resolution thanks to inherently low noise. These make the CTR6500 perfectly suited to high-accuracy temperature measurement and calibration. The CTR6500 has 25 Ω and 100 Ω internal standard resistors and can also be used with external standard resistors. It has a ratio range of 0 ... 4.9999999 or 0 ... 500 Ω resistance and is capable of measuring temperature ranges to meet ITS 90, CVD and EN 60751 standards. The results are shown on the large-scale, multi-function VFD screen. The mean, min and max value, standard deviation and the sampling rate can also be displayed with a separate graphical display. To ensure the long-term reliability the CTR6500 uses surface mount technology with no mechanical relays.